The Wolseley tearoom, a ten-minute stroll from the Metropolitan London hotel, provides a convivial atmosphere for a spot of tea with a friend or an extended "business" luncheon. At AMPR, we’re lucky to work a stone’s throw away from the Union Square Greenmarket. With August’s cornucopia of locally grown produce, it’s hard to shake that “so-many-recipes-so-little-time” feeling while meandering through the various stalls. But fruit-wise, delicate berries from the Hudson Valley – in our opinion – always steal the show. Danielle took her finger out of her mouth and took a bite. I watched her. She took another. And another. I took a bite myself. It was magnificent. The fruit was intoxicatingly fragrant and each berry released its juice only in the mouth, where it met the sweet, crumbly crust. “Why is this so much better than other tarts?” I asked. While we can’t comment on how the Big Apple’s Greenmarket compares to the fat cows and island berries of Oléron, we can happily confirm that this tart is a welcome taste of summer – anywhere , anytime. Now, be inspired! Place sugar and flour in a large mixing bowl and whisk to combine. Add the butter squares to the flour mixture and blend using a pastry blender or forks until the mixture resembles coarse cornmeal. Add cream to the egg yolk and pour into flour mixture. Mix lightly with a fork until the pastry holds together in a small ball. If it’s not moist enough, add a tablespoon or so of water. Sprinkle some flour across a counter and push the dough with the heel of your palm until it has been worked through. Do not over-mix. Gather the dough into a ball, wrap it in plastic wrap, and let rest in the refrigerator for at least three hours. Preheat the oven to 350 degrees Fahrenheit. Remove the dough and allow to warm on the countertop for ten minutes. On a floured surface, flatten the ball and roll it into an eleven-inch circle. Fit gently into an eight- or nine-inch tart pan with a fluted edge and removable bottom. Press into pan gently, being careful not to stretch the dough. Trim off the edges and freeze for ten minutes to firm. Line the tart shell with aluminum foil and fill with rice or dried beans. Bake 20 minutes. Remove aluminum foil and filler and bake for five minutes more or until golden. Remove from oven and allow to cool while making the filling. Blend the almonds and three tablespoons of the sugar in a food processor until it is a fine powder. In a separate bowl, cream butter with the remaining sugar, and then add the yolks. Fold in the almond-sugar mixture and vanilla to combine. Spread the almond mixture into the pre-baked crust and top with two cups of the fresh berries. Sprinkle the tart with two tablespoons of sugar and bake for 40 minutes or until just set. Cool at least two hours. 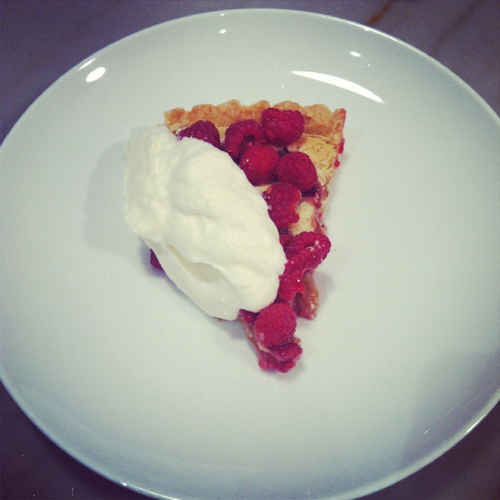 Just before serving, cover the tart with the remaining two cups of raspberries. Garnish with powdered sugar or brush the top with a simple glaze made from two tablespoons currant jam heated with one tablespoon of water. Bon appétit! Photo was taken by Ben from the AMPR team.